Layering is a method of propagation by which a stem or a shoot of a plant is induced to produce roots while still being attached to the parent plant. Some trees and shrubs, and in particular pendulous species will layer themselves naturally when their stems touch the ground. Examples of this are often exhibited by Forsythia suspensa and Salix x chrysocoma. The majority of woody plants may be layered, and this method will often prove successful when propagation from cuttings fails. Even some herbaceous plants will respond to layering, notably carnations. Surprisingly, shrub stems can be layered at any time of year, but September to November will provide the best results. Prior to layering, dig the surrounding soil to break up any compressed ground. Enrich poor, thin soils with fine-graded moss peat, and lighten heavy soils with horticultural grade coarse sand. The chosen shoots should be healthy, vigorous and between 1-2 years old. 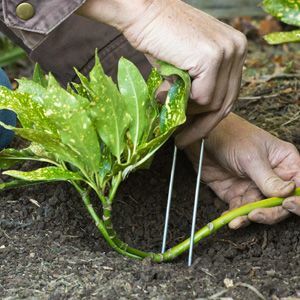 Bend the shoot down to soil level with the growing tip held upwards at a right angle to the soil and supported in place by a sturdy cane. This will encourage apical dominance with will allow the new plant to form the characteristic shape of the parent plant. 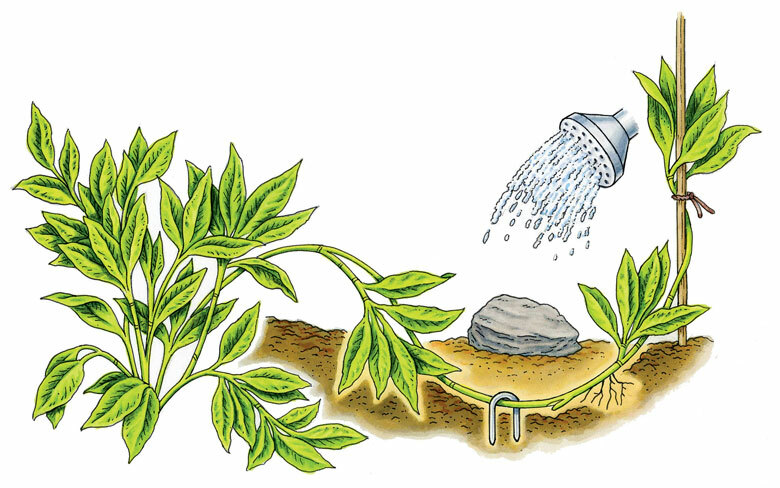 Inset the bent section of the stem into the soil and secure in place with a 'U'-shaped section of strong wire or stones. Cover the bent section with soil and firm in place. Rooting can be encouraged by wounding the bent section of the stem, either by removing a small sliver or circlet of bark, or by making a shallow, oblique cut into the stem so that a small tongue opens then the shoot is bent. Depending on the species a small application of rooting hormone powder to the wound may be necessary to encourage root initiation. Be aware that this method of propagation is comparatively slow compared to cuttings, but it should be possible to sever the connection to the parent plant after 1-3 years when the plants are dormant. The rooted cutting is now ready to be lifted and planted into its final position. Transplanting can made easier by layering the stems into pots or boxes buried into the soil, but care must be taken to make sure that the stems do not dry out during prolonged period of hot, dry weather.